You know the beginning of any good ensemble-cast blockbuster, where the ringleader travels to goofy locations collecting a ragtag bunch of specialized misfits to assemble his crack squad? The tough guy, the master thief, the tech nerd, the female. Collecting the squad that makes up the Rīc Kom (“rīcības komiteja,” or organizing committee) is just like that. I’m not saying that we’re all a bunch of superheroes, but, we’re basically all a bunch of superheroes. 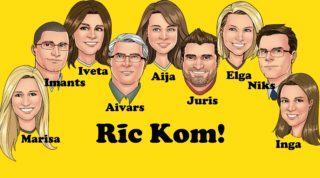 The Rīc Kom! Separate from the festival’s talented program directors and their teams, the nine-member Rīc Kom handles overarching festival logistics and makes sure all the fragmented pieces come together. While program directors hail from all along the East Coast and beyond, Gudrā stuck with her fellow D.C. locals for Rīc Kom. Four of us, Gudrā included, recently worked together on the Rīc Kom for 2015’s ALA Meistarsacīkstes, an annual sports tournament. Nik Timrots, in addition to working with the American Latvian Youth Association and the Joint Baltic American National Committee, was the head of this Meistarsacīkstes Rīc Kom and, having concocted the original Dziesmu Svētki plan with Gudrā, naturally took his place as her right-hand man. Working as a transportation manager for the University of Maryland Department of Transportation Services with 3 million annual passengers and 200 bus drivers under his watchful eye, Timrots is no stranger to large-scale logistics. He took a strong lead in early planning and research, contacting venues and hotels, and keeping initial efforts focused and broken down into smaller tasks. Also sliding over from the Meistarsacīkstes Rīc Kom were Inga Bebre and myself. My Latvian society credits include work with children’s summer camp Katskiļi, the Latvian School of Washington, the Latvian Lutheran Church of Washington, and D.C. folk-dancing troupe Namejs. Having been the webmaster for both Namejs and Meistarsacīkstes, I happily took on the Dziesmu Svētki roles of webmaster, secretary, and marketing-team member. I can think of nobody with whom I would rather work on any Latvian project than my longtime close friend Inga Bebre, one of the most organized and dependable people I have ever met. From our time together in Namejs and Meistarsacīkstes, I know that if you want something done and done well, with a solid system in place, it should be delegated to her. Bebre most notably demonstrated her abilities while serving as the head of the Rīc Kom for the American Latvian Youth Association Congress in D.C., a complicated assignment with countless moving parts. Dependability, a mastery of spreadsheets, organizational skills, and attention to detail make Bebre the perfect candidate for one of Dziesmu Svētki’s most complicated and detail-driven tasks: ticket sales. Gudrā wasn’t done recruiting fellow Namejs dancers. She broached the subject of a Baltimore Dziesmu Svētki with former dancer Juris Mohseni, a Sudrabavots folk group singer and accordion player, while watching a football game. His first reaction? “Excited! Thought it would be cool!” he later told me with a huge grin. But then, “Didn’t think I would have ANY part of it!” Attending? Sure! Actually leading the thing? Not so much. His mind was changed by the enthusiasm of his brother, Imants, another Namejs member being recruited by Gudrā. “I wanted to do something our grandmother would be proud of, even though she’s not with us anymore,” Imants explained somberly. That sentiment got to Juris, and he committed 100%, taking on the high-pressure job of treasurer for Latvian-American society’s most expensive event. Not that Juris is at all daunted by the task; as a professional budget analyst, he’s used to dealing with billion-dollar-plus budgets (as well as his homeowners association’s $13,000 budget) on a daily basis. While Juris took on one of the most traditional Rīc Kom roles, Imants took on something newer: project technology. “We didn’t even know that we needed all this technology, but I think it revolutionized the way that we work,” Gudrā said about Imants’s contribution. “He’s the wizard.” While Dziesmu Svētki as an event hasn’t changed much over the generations, the way in which it is organized certainly has thanks to the role of technology (imagine how much our grandparents would have appreciated MP3s while learning songs and YouTube while learning dances). Imants is responsible for researching, implementing, and patiently helping the rest of us understand the best use of technology, from online registration forms and payment options, to team workflow programs that keep Rīc Kom working efficiently — all achievements his grandmother never would have imagined in her day, but of which I am sure she is proud nonetheless. A song and dance festival cannot survive with dancers alone, and neither can its Rīc Kom. An enthusiastic music lover who sings in the choir at every Dziesmu Svētki, Aivars Osvalds has been active in Latvian-American society for as long as I can remember, holding positions with the American Latvian Association, the World Federation of Free Latvians, the Latvian Lutheran Church of Washington, the Lettonia fraternal organizations, and the Baltic countries exhibition at the Smithsonian Folklife Festival. A lot of us knew him as the primary mover and shaker behind the re-emergence of youth seminar 2×2, where passion and drive for the project really made it take off (having attended the first of these seminars in West Virginia, I can personally attest to the success of this effort, as it proved to be one of the most inspirational weeks of my life). It was this exact drive and passion that we needed, especially to pull off a project of this size in such a short timespan, and Osvalds has definitely not been a disappointment in this regard. Brought on board to handle evening events, a colossal project on its own, he was immediately enthusiastic to help wherever needed, volunteering to work on fundraising, hotel contacts, and many other loose ends that have crept up throughout the planning process. Osvalds immediately suggested bringing in his friend Iveta Grava, the only Rīc Kom member with prior experience in organizing a Dziesmu Svētki. Born and raised in Latvia, Grava’s extensive experience in the Latvian arts scene include not just leadership roles with two Dziesmu Svētki in Latvia, but also work at the Latvian National Opera and the World Federation of Free Latvians, membership in the prestigious Ave Sol choir, and a lifetime of music education (including a degree in harp performance). Originally slated to be our main point of contact with Latvian performers and organizations, Grava soon also took on fundraising and theatre duties, and provides beautiful Latvian-language prose for the festival’s promotional material. She describes her involvement with the Latvian saying “Iedod velnam mazo pirkstiņu un viņš paņem visu roku” (“Give the devil your pinkie and he takes your entire arm”). In other words, she was hooked like the rest of us. Gudrā’s recruitment tale might have ended here, until fate twisted its chilly way into Gudrā’s commute one winter morning. She sat on the metro train reading some bad news on her phone: an email from a potential team member turning down one of our largest remaining positions: volunteer coordinator. Gudrā didn’t have too much time to dwell in her disappointment, however, because just then a stranger sitting nearby introduced herself. Aija Moeller, who usually rides her bike to work but was driven onto the metro due to the bitter cold, noticed Latvian symbols on Gudrā’s winter scarf. They got to talking, and soon discovered two amazing things about one another. Moeller, who had moved to D.C. from Latvia years earlier, had just read in the local church bulletin about potential Dziesmu Svētki plans and had made up her mind to offer her services. And here before her sat the very woman she had intended to contact. And Gudrā, freshly mourning her lack of a volunteer coordinator, was amazed to hear what her new acquaintance did for a living: Moeller was a volunteer coordinator for a non-profit. Newly minted as the Dziesmu Svētki volunteer coordinator, but acknowledging that she had little to do in that regard for months to come, Moeller threw herself into other essential projects, organizing the film festival, joining the marketing team, and patiently proofreading various materials. So that’s us. I’ll be honest: I’d never really given much thought to the Rīc Kom during previous festivals. After all, the buzz surrounding a Dziesmu Svētki is, rightly, about the excitement of seeing friends, sharing culture, dancing all day and all night; it’s not about the person filling out 501c3 paperwork. I’ve listed here some of the relevant experience of our members, but the truth is that there’s only one thing that anyone actually needs to know about us. It’s a response that I received independently from two separate Rīc Kom teammates when I interviewed them for this article. “We are all volunteers and I think that is the answer to ‘what qualifies you to work on this,’” wrote one. The XIV Latvian-American Song and Dance Festival will take place in Baltimore, Maryland, from June 29 to July 3, 2017. For more information, please visit the Festival website or write to info@latviansongfest2017.com.